There are some seriously strange insets in our world, and when they get to the size of this SPHINGIDAE Coequosa australasiae, they can inspire awe or dread. 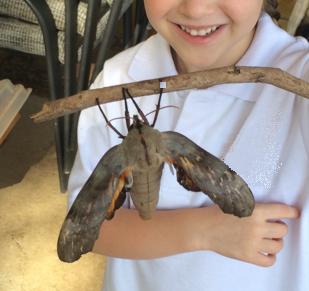 This is a species of Hawk Moth whose caterpillars feed on select species of Eucalypts. Here, we occasionally find them crawling up a tree after they have finished pupating and are on the hunt for a mate. This female was rescued from one of our cats. Her wings were scratched up so she has not been able to fly away. This year, we have had plenty of rainfall and the Eucalypts have had a huge growth spurt. Given such a great diet, we believe this is why this female is as large as she is. We measured her wingspan at an astonishing 13.8cm! Normally, they measure around 12cm. After a couple of days rest, this huge girl was released in the early evening to climb up the tree she was found under. Hopefully next season there will be some of her offspring in the trees above us! < Previous What seeds work best?